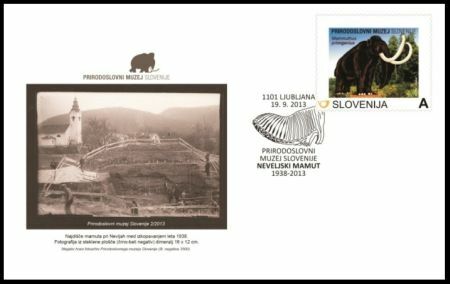 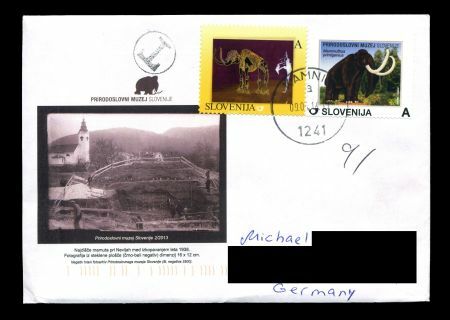 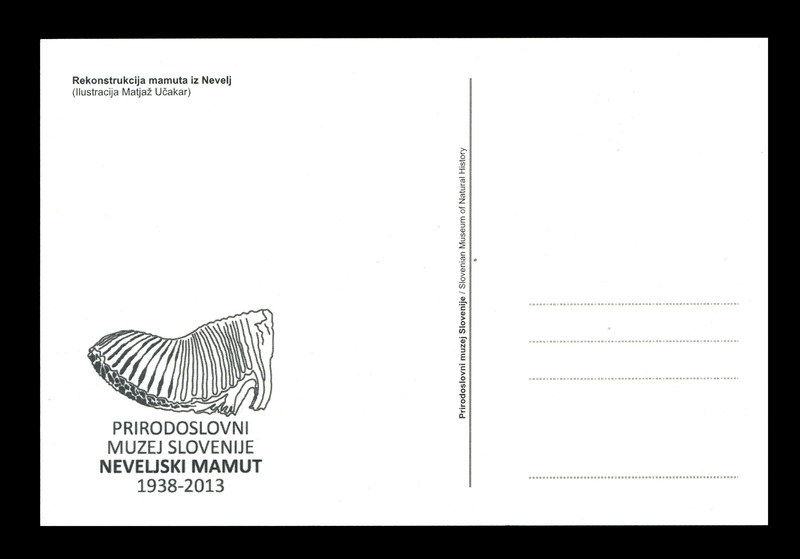 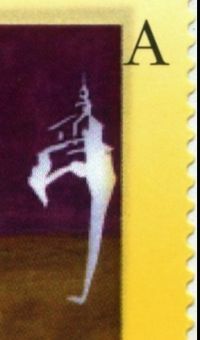 In order to commemorate "75 years since discovery of a mammoth's fossils in Nevlje by Kamnik" Natural History Museum of Slovenia in Ljubljana, issued on 19.09.2013, self-adhesive personalized stamp, shows reconstruction of the animals, which is on display in the museum. 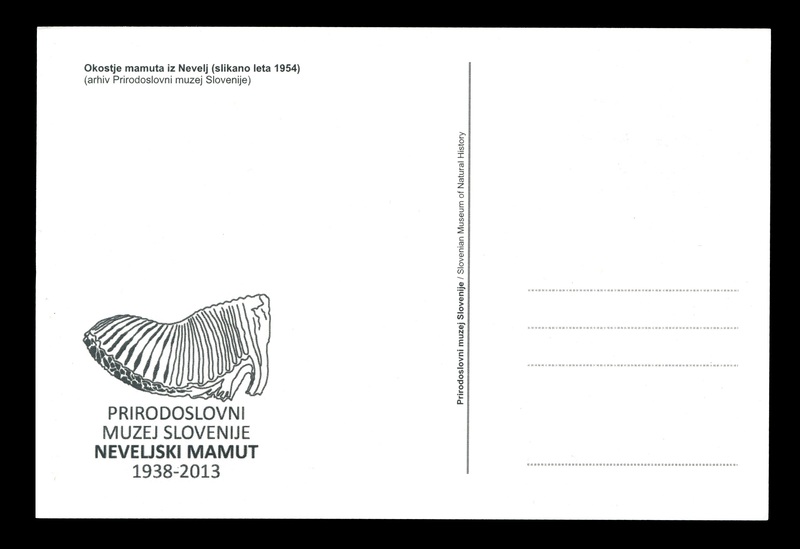 Moreover, special Philatelic Exhibition took place in the museum between 19.09.2013 and 31.12.2013. 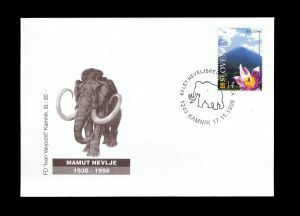 Five frames, prepared by Matjaz Učakar (the stamp designer) and Tone Simončič, showed various philatelic items related to the animals of the Ice Age, which lived at Neveljska (place where fossils of the mammoth are found) , together with some other stamps and covers shows modern animals and plants typical for the area of ​​Slovenia and issued by the Post of Slovenia in last two decades. 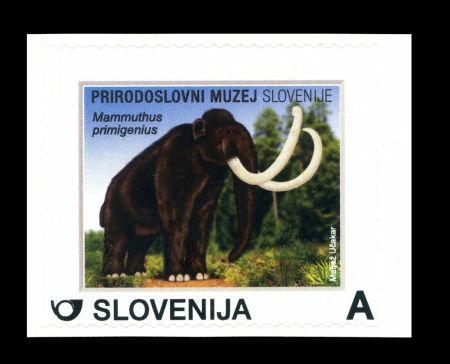 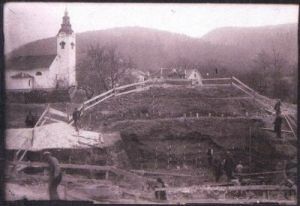 Along with the National Museum of Slovenia, which is located in the same building, the Natural History Museum of Slovenia is Slovenia's oldest cultural and scientific institution, originating as the Provincial Museum of Carniola, which was established in 1821 and became the National Museum in 1921. 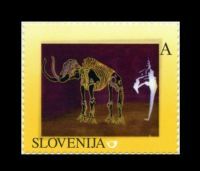 The museum, located in the town center of Ljubljana near Tivoli Park, gained from the Austrian government at its establishment the Žiga Zois collection of books and minerals and the Count Hohenwart collection of mollusk shells. 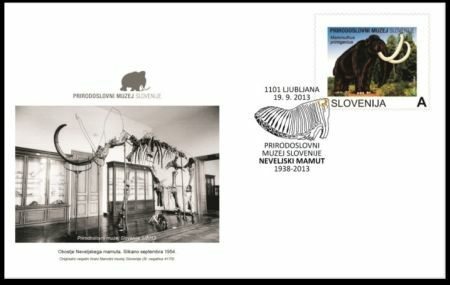 It has a dislocated unit, the Alpine Botanical Garden Juliana, in Trenta. 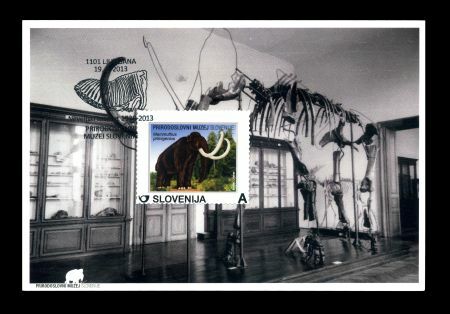 The museum's geological-palaeontological collections include fossils from various Slovene sites, including an almost complete 20,000-year-old mammoth skeleton found at Nevlje near Kamnik. 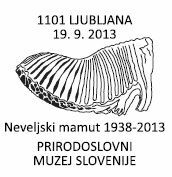 Also of significance are a 210 million-year-old 84-centimeter-long fish skeleton found in the Triglav Mountains and a Miocene-era baleen whale skeleton found in Slovenske Gorice. 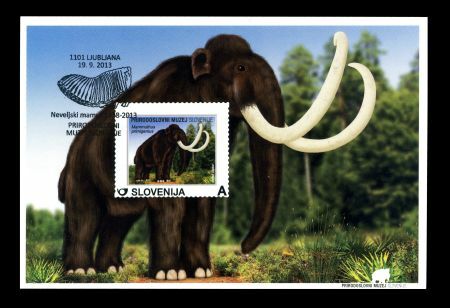 Hohenwart's collection of mollusk shells comprises about 5,000 specimens, dating from 1831 and originating mainly from the Indo-Pacific. 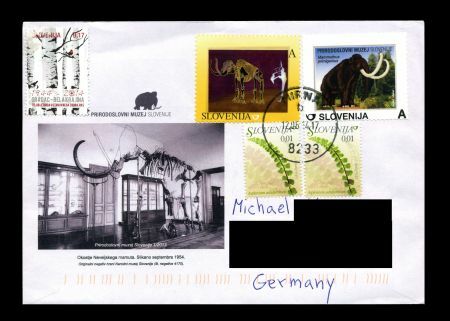 The insect collection of Ferdinand J. Schmidt includes several interesting specimens, notably the "narrow-necked" blind cave beetles (Leptodirus hochenwartii) that were described in 1831 as the first cave insect. The plants and animals of the mountains, marshes, and woods are shown in specialized dioramas. 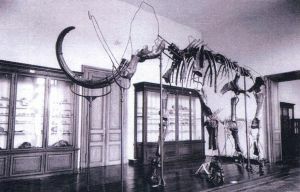 Also on view are permanent bird, reptile, fish, mammal and skeleton collections.